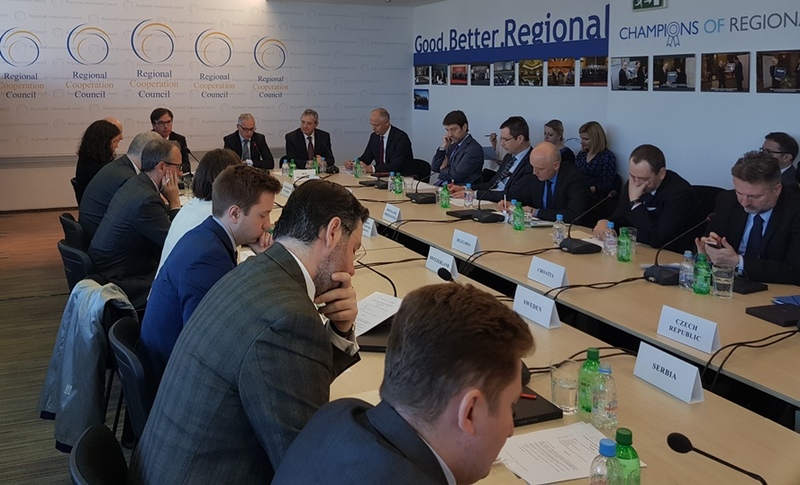 Sarajevo – The Regional Cooperation Council (RCC) Secretary General Goran Svilanovic presented the Report on the organisation's activities in the last quarter of the past year at the first meeting of the Board of in 2018, held in Sarajevo today. “The goals at the centre of the RCC SWP 2017-2019 resonate very well with the priorities of the regional economic integration agenda. The Multi-annual Action Plan on Regional Economic Area (MAP REA), and its related activities were at the core of the RCC Secretariat activities in the period September-December 2017. The RCC, in close cooperation with national authorities and other stakeholders, has undertaken several activities to support the implementation of the MAP REA actions,” said Svilanovic. He also reminded that it has been ten years since the RCC has been serving as a sui generis organization promoting regional cooperation in South East Europe. The RCC’s all-inclusive character enabled the entire region to benefit and contribute to the regional cooperation process. The RCC capitalized on its intrinsic role as the operational arm of the SEECP in order to ensure that its activities are aligned with the programmes of the Participants holding the SEECP C-i-O and serve the collective interests of all RCC participants from the SEE region. Damijan Sedar, South-East European Cooperation Process Chairmanship-in-Office (SEECP C-i-O) Coordinator, on behalf of the Slovenian SEECP C-i-O informed the meeting participants on the activities of the Slovenian CiO and the plans for SEECP Summit to be held in April in Brdo pri Kranju. The Board also heard information on the most important future activities of the RCC Secretariat, in particular those related to the implementation of the RCC Strategy and Work Programme 2017 – 2019. Regional Youth Cooperation Office (RYCO) presented its work, plans and goals to the RCC Board as a regular part of the meeting dedicated to the presentation of other regional initiatives and cooperation structures. This was the 34th meeting of the RCC Board, which meets three times a year and is chaired by the RCC Secretary General.